It was an intimate moment between the two of them. Sure, there were others around. Some were undoubtedly watching with their own interpretations wondering what it was that they were seeing. Perhaps there was some dis-ease among a few, but then again, they were likely preoccupied by the fact that they were eating dinner with and talking to a man who was long enough in the grave to have a stench. Judas made his opinion known as Mary used her hair to apply the mixture of nard and tears to Jesus’s feet in her final act of love this side of the tomb. It was a frozen point in time special to the two people who were in it, who got it, who knew they needed it because it would be their last opportunity before the hands of fate would wrap them in its hatefully morbid grasp. Like Judas imposing his own concerns about selling the expensive perfume instead of “wasting” it on Jesus, we often find ourselves in similar situations where we are assigning our own bias from the periphery. Who knows if Judas was lining his pockets with the treasury money, but we do know that he was inserting himself into a space that wasn’t meant for him. I dreaded carrying the pager. Every chaplain in the hospital had to take turns, but I seemed to get it on days when I just wanted to set my mind on cruise control and get the day done with no interruptions. That Monday was no exception. When the pager started playing its irritating tune on my hip, I knew that I wasn’t going to get that luxury. The number on the pager told me that it was the ER. Most of the time, you don’t have any trouble finding your destination when you go to the ER because there is a flurry of activity and you make your way to it like a moth to a flame – occasionally with the same effects. Diego’s mother was sitting in a chair just outside the bay where her three year-old son was covered in what looked like bubble wrap to keep him warm. Tubes extended everywhere from his small body and machines were whirring and humming all around. His father sat to the right of the bed with his head in his hands occasionally looking up at his boy in dismay. His mom was understandably in hysterics and I knelt by her side to try to offer some comfort. There wasn’t much I could do other than just be there and sometimes that has to be enough. There were no magic words or incantations that were going to undo what had already been done at the bottom of a pool covered in a tarp that the unknowing tot had apparently mistaken for a trampoline. She wanted something tangible to hold on to because she couldn’t hold her baby. The team was doing their best to bring him back to life, but most knew it was futile. I was doing my best not to show my emotions so that I could be strong for this broken woman, but I about came undone when she fell on the ground and clutched his tiny little shoes to her chest. Seemingly washing them with her hair and tears in a Mary-like gesture for one who would not be raised. It’s hard to forget things like that. I wondered how Diego was doing and eventually assumed he had already died as I went about my week tending to other emergencies. It was that following Thursday when, once again, that dreaded piece of plastic was clasped to my belt. With the same desire to go about my day uninterrupted, I looked with disdain at the number on the display as it played its foreboding tune. I didn’t recognize the extension and had to call to see where I was headed. Pediatric Intensive Care Unit. I pressed the button outside the unit and waited for a nurse to buzz me in. As the doors opened, the antiseptic smell of rubbing alcohol and every antibacterial potion filled my nostrils. Being a lifelong member of the I-Hate-Needles Club, it never failed to make me wince. Making my way to the nurses’ station I made eye contact with the nurse in charge for that shift. She tilted her head toward the open door down the hall and I looked wondering who was in there. I could see Diego’s mom poking her head out the door sobbing, looking down the hall and then briefly at me before she went back inside the room. So it was going to be one of those days. I had no idea what had happened to Diego and his family. The days blended together and other patients, other crises didn’t necessarily make me forget about them, but at least took them from the forefront of my awareness. Now I at least knew they had made it this far. I came around the side of the station and stood to the right of the nurse who was pouring over some documents. She looked up at me with a look that I occasionally got from nurses that said, “What the hell do I do?” She looked down the hall a few doors down from Diego’s room to where I could see people walking in a circle and hear music of some kind as they undulated to the beat. “He’s gone and I ain’t going in there to tell them, Chappy.” She looked back up at me. “Alright. I’ll do it.” I took a deep breath and shook my head as I made my way toward the sound of what seemed to be praise and worship music in Spanish. The people were waving their hands, some crying, as they threw prayers to the ceiling as if the intensity of their prayers was proportionate to the distance they would travel to God’s ears. The weeping was of biblical proportions – tearing of clothes and heaping of ashes. It was almost too much to bear seeing these people come apart. Some collapsed into each other in a melee of tears and others began to pray through the sobbing as they once again began their circular dance. I led a group of them back to Diego’s room and wasn’t prepared for what I would find. I took a deep breath before I entered the room and unlike Lazarus, there was no smell of death. Although he never regained any of his brain function after his fateful swim, he remained “alive” on machines until minutes before. With the kind of grief that only a mother could feel, she held his lifeless body wrapped in a brown coarse blanket almost like a saddle blanket. She hugged him close to her breast and I could see her shoulders tremble and heave from behind as she wept. I placed a hand on her shoulder and once again did everything within my power to keep from losing it myself. As an empath, it’s sometimes almost too unbearable to stand so close to a burning bush. She turned to me and held out her little boy. At first, I didn’t know what to do. I stood frozen as I looked at the shell of this tiny life and then back up at her. Then I got it. I took Diego in my arms and held him tight for a few moments. I kissed his smooth precious forehead and turned and passed him on to the person next to me – probably an aunt. It was hard to see her face through my tears and that was ok.
As I watched each person hold Diego and anoint his face and hands with their tears, my feeling of dismay and discomfort gave way to a better realization. Where I initially felt an extreme dis-ease around them passing this body around and that they were somehow doing something wrong, I became aware that it was I who was wrong. It wasn’t that these people were doing something horrific or unconscionable. It was I, who like Judas, had walked into a thin place and imposed my own interpretations as I wasn’t immediately able to see the pure holiness of it all. Let’s imagine for a moment that we could see the world like God does. I often imagine him sitting from his place on high looking down on us and seeing the commotion and hearing the cacophony throughout the week. Then, on Sunday as we gather to worship, our voices join together in a swell of harmony. Different churches singing different hymns and praise songs all flowing together to create a beautiful chorus in which all of the voices seem to be in one accord. Everything that we see in this world, we see with our own eyes – both spiritually and physically. Events and objects are what we deem them based upon that perception, although in reality, they are so much more and so different in God’s eyes. Amazing isn’t it? The exact same event, yet it was viewed so differently by two different people. What about in our lives? Are there times when we can’t see the forest for the trees because we are putting our own slant on the situation? It is like the time in Luke 7:36-50 when Jesus was having dinner at Simon the Pharisee’s house and a prostitute came and poured expensive perfume on his feet and kissed them. 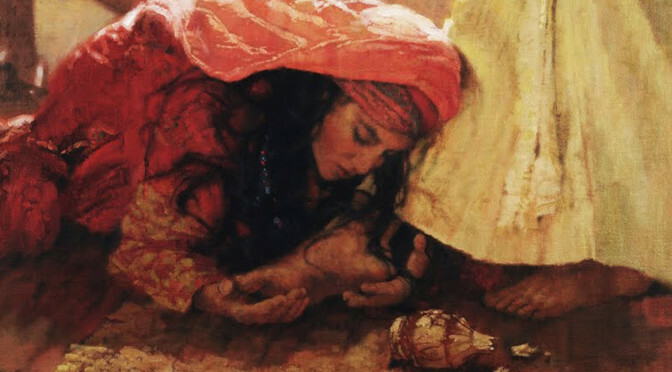 Not only did Simon think that she was wasting the perfume, but he was shocked that Jesus would let such a sinner touch him. Jesus quickly set him straight and helped him see it from the true perspective that not only would her forgiveness be so much more profound, but that he hadn’t even offered water for Jesus feet. In business and in life we are faced with many situations and events where we are forced to make judgments. In some cases, we make judgments when we are not even invited to. In either event, we must always remember that there are two sides to every coin. Let’s pray that we see things more clearly through the eyes of the One who gave us eyes to see.